What are bento? Bento are Japanese style lunch boxes. But if you’re thinking “soggy egg sandwich packed lunch”, think again! Fun, healthy, fancy, formal – there are many different types of bento lunch and many different kinds of bento lunch box! Learn how to make your very own, with the clear, step-by-step instructions and beautiful photos in Yum-Yum Bento Box. 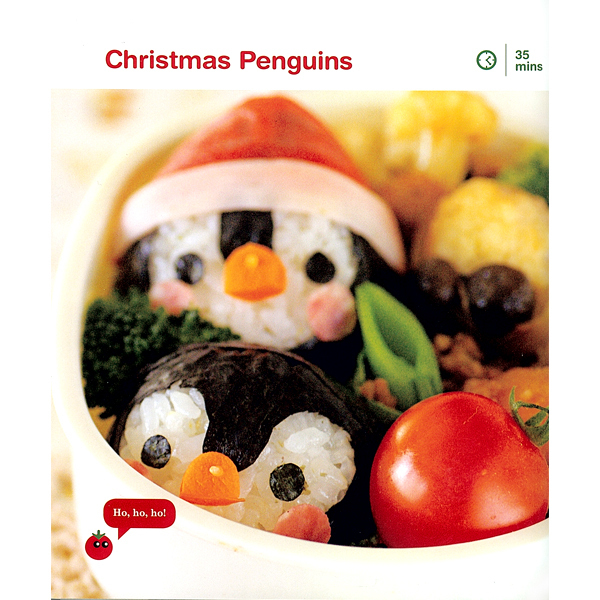 A collaboration between two bento-y bloggers, Piko from Adventures in Bento Making and Luckysudnae from Cute Obento, it covers everything from easy to make mini snacks to fun and healthy character bento (kyaraben) like these lovely Christmas Penguins, ahhh! If you want to be certain to get your very own copy, just browse on over to Japan Centre! To be in with a chance of winning this book, simply leave a comment on this blog post or our Facebook post with a photo of a Japanese meal you’ve cooked (links ok!). You can also tweet us @JapanCentre with the hastag #bento. We will choose a winner on Friday 19th September. for their amazing Girl gathering eggs decoben! We would like to congratulate dosirakbento on their well-deserved win, and also highly encourage absolutely everybody who has an interest in creative bento box making to check out dosirakbento’s incredible blog. It is full of entries about making bento, including how to gather and store ingredients, the best equipment to use, and other handy tips. We think this blog is about to get even better now that they will have their very own copy of Yum Yum Bento Box from which to draw inspiration! We would like to thank everybody who submitted pictures of their Japanese dishes to us, whether here at Inside Japan Centre or on Facebook or Twitter. We had so many amazing entries and picking just one winner was more difficult than we could have imagined. Keep up your amazing Japanese cooking, everybody, and don’t forget to visit Japan Centre online if you are ever in need of inspiration! Posted in Books and tagged bento, competition, cooking, Recipes. Bookmark the permalink. Here’s my one and only attempt at a kyaraben: https://www.flickr.com/photos/haiku_girl/14514322729 I’d love to win this book so I could have some more ideas about what to do next!